Images: 41 aneer, commonly known as cottage cheese, is a prominent and popular ingredient when it comes to snacks. Be it in the form of tikkis and kebabs or as a part of stuffed cutlets and pakodas, you will always find paneer featuring in a snack platter. This book is dedicated to that magic ingredient, and aims to cover a wide variety of paneer-based snacks. We have not only included traditional paneer starters and snacks like Bharwan Paneer Chilli Pakodas and Chilli Paneer but also other paneer-based snacks such as chaats, salads and parathas. 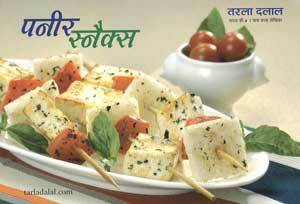 Paneer Cucumber/ Zucchini Slices, and Nutri Waffles are typical examples of the variety that paneer offers! Each recipe is carefully teamed with a dip or chutney, which completes the snack. Celebrate the goodness and taste of paneer with these heavenly combos!